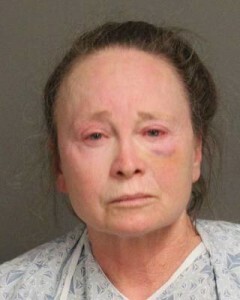 The 61-year-old woman arrested for murdering a man at the Dancing Horse Retreat in Paso Robles on Saturday has been identified as Nicole Honait Luxor, a self described clairvoyant. San Luis Obispo County deputies booked Luxor, who was sporting a black eye, into the San Luis Obispo County Jail on a murder charge. Her bail has been set at $1 million. Luxor owns and operates the Dancing Horse Retreat “where she breeds and trains Paso Fino “dancing horses” and conducts individual, group, and couple’s readings along with special ceremonial events, and celebrations,” according to Luxor’s website. “Nicole communicates with animals and spirit guides and can “receive” quintessential information about an individual’s soul,” the website says. Shortly after 3 p.m., deputies responded to a report of an assault with a deadly weapon against a male victim at the Old Nacimiento Road retreat. Luor had barricaded herself inside. After several hours, deputies were able to enter the home where they found the man’s body. Luxor then fired one shot at deputies and retreated to an upstairs bedroom. No one was injured. Negotiators attempted to reach Luxor on her phone, but were unable to make contact. Deputies then shot tear gas into the upstairs bedroom. Luxor responded by firing multiple gunshots at law enforcement personnel. Again, no one was injured. Just before midnight, Luxor surrendered and deputies took her into custody unharmed. The name of the alleged victim, a man in his 30s, is not being released pending notification of his next of kin. She should have seen it coming….